OPPO has finally announced its latest flagship Reno series in China. 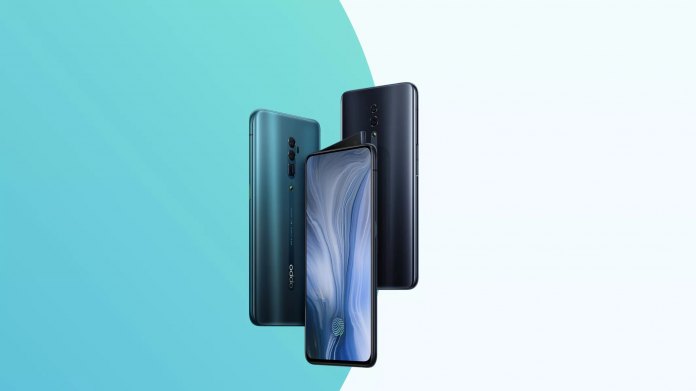 The OPPO Reno comes in two versions- the Reno and the Reno 10x Zoom Edition. The flagship 10x Zoom Edition comes with Snapdragon 855 processor, a 48-megapixel camera in triple camera setup While the standard version comes with Snapdragon 710 processor and a 48MP camera in dual camera setup. 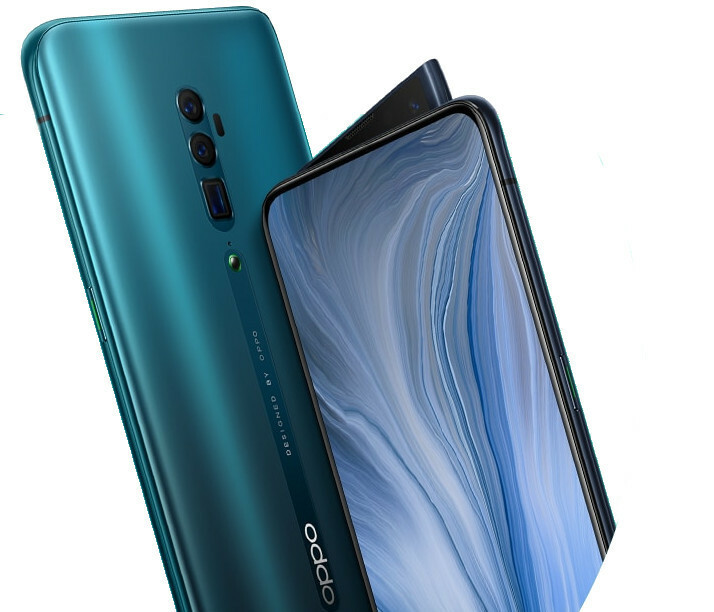 The new OPPO Reno series smartphones come with an unusual pop-up selfie camera design with a notch-less AMOLED display. 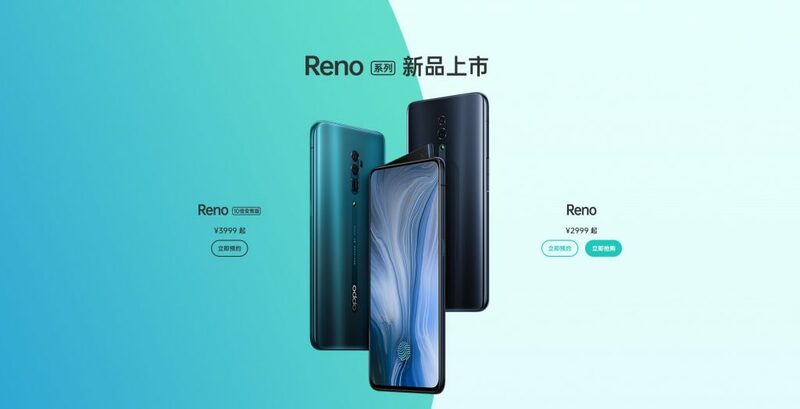 Both the Reno phones also have an in-display fingerprint scanner. Let’s check put full specifications and price details of both the Reno phones. The Reno Standard Edition sports a 6.4-inch Full HD+(2340×1080 pixels) 19:5:9 aspect ratio AMOLED display with Gorilla Glass 6 protection. It is powered by Snapdragon 710 processor with Adreno 616 GPU. It packs up to 8GB RAM and up to 256GB storage. The dual rear camera setup consists of a 48MP primary camera with Sony IMX586 sensor, 0.8um pixel size, and f/1.7 aperture. There is a 5MP secondary camera with f/2.4 aperture. It sports a 16MP front camera with LED flash, f/2.0 aperture, and 79.3° wide angle lens. The smartphone runs on Android 9.0 Pie with ColorOS 6.0 on top. Connectivity options on the phone include Dual 4G VoLTE, WiFi 802.11 ac (2.4GHz + 5GHz), Bluetooth 5, 3.5 mm audio jack, GPS/GLONASS, NFC, and USB Type-C. It supports Hi-Res audio with Dolby Atmos. The device packs a 3765mAh battery with VOOC 3.0 fast charging support. The Reno 10X Zoom Edition comes with a 6.6-inch Full HD+(2340 × 1080 pixels) 19:5:9 aspect ratio AMOLED display with Gorilla Glass 6 protection. It is powered by Snapdragon 855 7nm processor paired with up to 8GB RAM and up to 256GB storage. The smartphone runs on Android 9.0 Pie with ColorOS 6.0 on top. Connectivity options are Dual 4G VoLTE, WiFi 802.11ac dual-band (2×2 MU-MIMO), Bluetooth 5, Dual-frequency (L1+L5) GPS/GLONASS/Beidou, NFC, and USB Type-C. It doesn’t sport a 3.5mm headphone jack. It offers USB Type-C audio and supports Hi-Res audio with Dolby Atmos. It has triple microphones. The device packs a 4065mAh battery with VOOC 3.0 fast charging support. Its triple rear camera comes with a 48MP primary camera with Sony IMX586 sensor, f/1.7 aperture, 0.8um pixel size, OIS, a 13MP periscope telephoto lens with f/3.0 aperture, an 8MP 120° Ultra Wide Lens with f/2.2 aperture. It offers 10x Hybrid Optical Zoom. There is a 16MP front camera with LED flash and f/2.0 aperture. 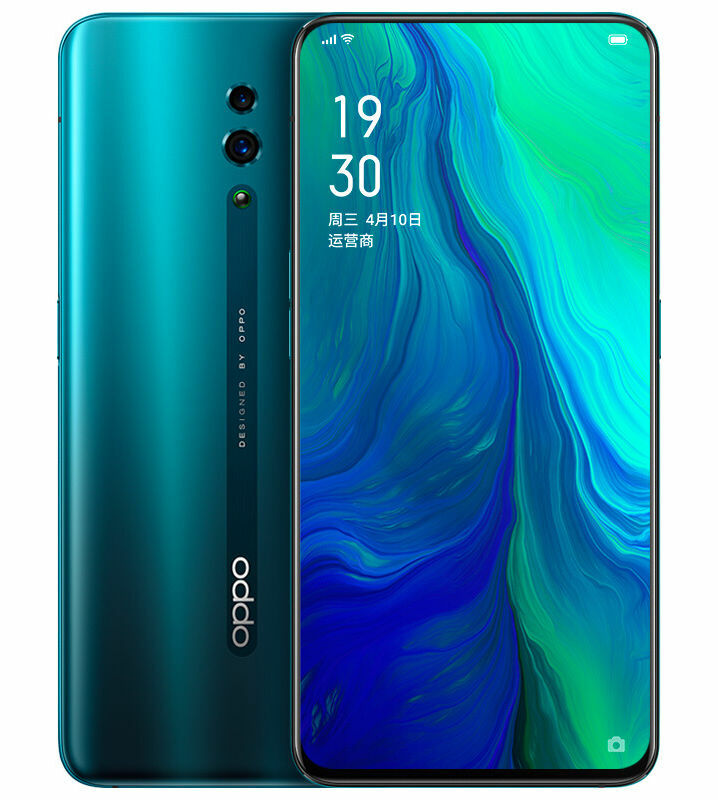 The OPPO Reno Standard Edition price starts at 2999 yuan (Rs. 30,895 approx.) for the 6GB/128GB version and goes up to 3599 yuan (Rs. 37,075 approx.) for the top-end 8GB/256GB version. It comes in Green, Pink, Purple, and Black colors and will go on sale from April 16. The OPPO Reno 10X Zoom Edition price starts at 3999 yuan (Rs. 41,190 approx.) for the 6GB/128GB version and goes up to 4799 yuan (Rs. 49,435 approx.) for the top-end 8GB/256GB version. It comes in Green and Black colors and will go on sale in mid-May. The company will also launch a 5G version of this phone next month.